Many people are familiar with eating disorders and disordered eating, but there is a significant amount of myth, misinformation and stigma surrounding these topics. There are 8-10 million Americans struggling with eating disorders. This statistic includes diagnoses of anorexia, bulimia, compulsive over-eating, and non-specific eating disorders that do not squarely fit into another category. A true eating disorder is a psychiatric diagnosis and may be accompanied by other psychiatric diagnoses, including depression, anxiety or obsessive-compulsive disorder. Anorexia has a 12x higher mortality rate for girls 15-24 years of age than all other causes of death. Eating disorders are often overlooked and missed by parents, friends, coaches, teachers, and healthcare professionals. Therefore, it is important to know the warning signs and be aware of resources to get help. We also see disordered eating pathology in our athletes, especially adolescent female athletes. You may recognize the term “Female Athlete Triad,” coined by the International Olympic Committee in 2005. This syndrome captured female athletes presenting with deficient energy intake that results in hormonal changes, bone density deficiencies and altered menstrual cycles. This terminology has recently been updated and re-termed Relative Energy Deficiency in Sport or RED-S. This new definition recognizes that men also present with energy deficiency and identifies the numerous other systems that are affected by the nutritional imbalance, including cardiovascular, gastrointestinal, hematological, psychological and musculoskeletal. Males and females in weight-dependent and aesthetic sports are especially susceptible to Relative Energy Deficiency, especially dance, diving, gymnastics, running, rowing and wrestling. RED-S can result from a caloric intake that is too low, caloric expenditure through exercise that is too high, or a combination of both. These athletes may present with fatigue, lowered performance, chronic infections, or musculoskeletal injuries that are slow to heal or recurring. It is important to note that RED-S in athletes may or may not be accompanied with signs and symptoms that would also qualify an athlete with a disordered eating diagnosis. Physical therapists treating children, adolescents, and athletes should be aware of the signs and symptoms of these disorders. With Direct Access in GA, a PT may be the first to pick up on RED-S or an eating disorder. Athletes should be referred to professionals with specialized training in sports nutrition. Anyone with a suspected eating disorder should be referred to appropriate healthcare professionals, which may include an orthopedist or sports medicine physician, a pediatrician, a nutritionist, a family therapist or counselor, psychiatrist, etc. We often must take a team approach in treating these patients, frequently requiring consultation with the coach or teachers in the case of athletes and dancers. Any underlying issues in the family dynamic must also be addressed. 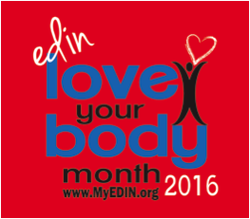 February is “Love Your Body Month” and this week is “National Eating Disorder Awareness Week.” If you, a friend, a family member, or a patient needs help there are resources available. 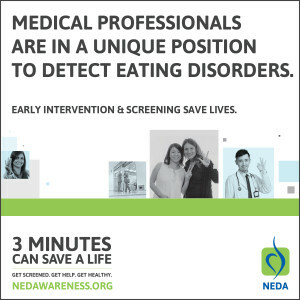 Go to www.myedin.org or www.nationaleatingdisorders.org.